What’s the Best Medicine for Back Pain? While inversion tables and neck traction devices may be helpful when at your physical therapist or at home, you can’t exactly take them with you to the store, your kid’s little league game, or while commuting to work. All those other times (or even during those times) may require a more internal remedy, i.e. pain medication. There are plenty of pain meds to choose from, both over-the-counter and especially prescription, so finding the best pain reliever for back pain can be difficult. To make matters worse, what works amazingly well for someone else may not work for you at all. Unfortunately, there is no “best” medicine for back pain that works for everyone. You may need to consult with your doctor and try a few different painkillers before finding one that works best for you. Fortunately, you can narrow down the list of potential medications with a basic understanding of the different options commonly used for back pain, as well as the most popular choices for each class of drug. There are countless brands of back pain medication out there, but most fall into one these categories. Understanding the characteristics of different types of medication will help you decide on the best meds for your personal needs, regardless of whether you and your doctor choose to go prescription or OTC for back pain, understanding the characteristics of different types of medication. NSAIDs (Non-Steroidal Anti-inflammatory Drugs) are one of the oldest forms of pain medication. 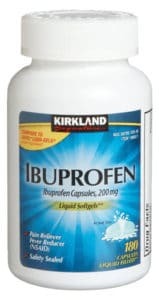 The two most common types are Ibuprofen and Asprin. These meds are non-addictive and help to reduce fever and inflammation in addition to pain. This makes them an excellent option for a variety of pain issues, including lower back pain. However, this class of medication is not recommended for anyone with a history of ulcers, gastro-intestinal problems, or stroke/heart problems (with the exception of aspirin). A very strong, often addictive form of pain medication, opioids are a prescription-only option your doctor may recommend for short-term (or long-term) relief in cases of severe pain. These range from Vicodin to Morphine. 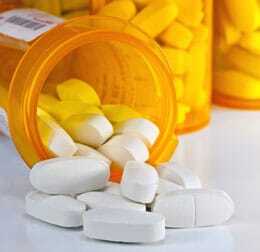 Some opioids, such as OxyContin, are highly controlled due to their high addiction rates. Norco is an example of combination opioid meds, which blend an opioid (hydrocodine) and analgesic (usually acetaminophen). A milder form of opioid, such as Tramadol, is an option of you are worried about using narcotics. We often hear about opioid abuse in the news, often involving celebrities or professional athletes. Opioids work by reducing the brain’s perception of pain. For many people, a certain euphoria is also felt which is the reason why some may get addicted over time. The vast majority of users take these prescription drugs responsibly and only when needed. When NSAIDs such as Ibuprofen simply do not help, your doctor or pain specialist will often start you off on a low dosage of Vicodin or Norco, two of the most commonly prescribed opioids. Constipation is a common side effect. Another popular type of pain reliever, acetaminophen (most commonly sold as Tylenol) is a mild analgesic which may be taken as a suppository, oral, or even intravenous medication. Most forms are available over the counter, although some varieties require a prescription. The only difference between acetaminophen and NSAID meds is the lack of anti-inflammatory effects. For this reason, the two classes are often combined during treatment of individuals recovering from surgery. It is also sometimes combined with opiates or caffeine to help treat specific ailments. While the American College of Physicians recommends acetaminophen for lower back pain, its effectiveness against inflammation and chronic back pain is questionable. 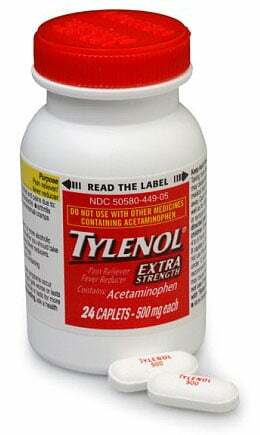 Acetaminophen products such as Tylenol are generally better suited for fever, but can provide affordable, temporary relief from mild to moderate back pain. The most powerful among anti-inflammatory drugs, steroids have the option of being taken orally or via injection for back pain relief. The latter can reduce some of the side effects of steroid use. Note that this is a short-term option, and is often used to prevent inflammation from becoming a chronic condition. However, there are many serious side effects to steroids, and injections should be taken no more than thee times per year. Some people experience a different type of pain after an epidural injection while others are pain-free after a single injection. 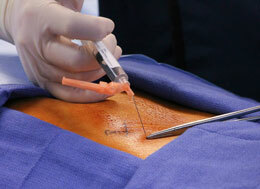 A referral to a spine or pain specialist is usually required to receive steroid injections into the spine. It’s a quick but not exactly a very pleasant process but the pain relief success rate is fairly high. Unfortunately the relief is almost always temporary, lasting anywhere from a couple days to a few months. In many cases, muscle spasms can be a factor in back pain. For such circumstances as a strained back, your doctor may prescribe a muscle relaxant such as Flexeril or Soma. The most common side effect is drowsiness, and these medications often significantly help with injuries in mere days of use. You may think that the inclusion of antidepressants is a joke revolving around how depressing a sore back can be, but some of these medications actually contain properties that reduce back pain. Duloxetine (AKA Cymbalta) is one common example of an antidepressant frequently used or chronic pain. 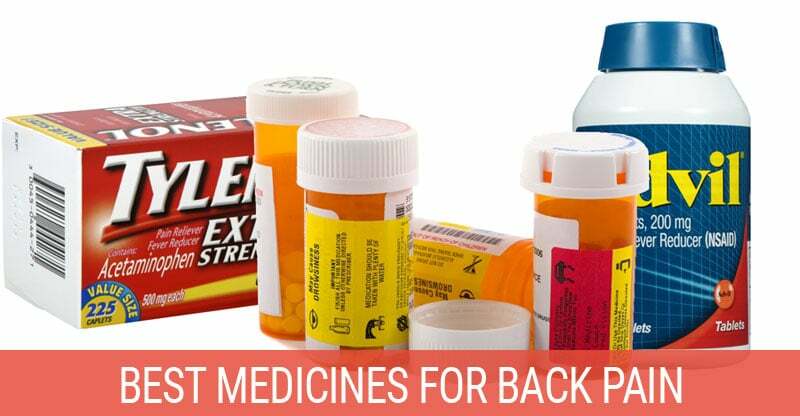 The following items are just a few of the many medicines available over the counter which are useful against back pain. You may even have some of these medicines already. In many cases, OTC meds are used to supplement a prescription drug. Because inflammation is a common theme that contributes to back pain, the anti-inflammatory drug Ibuprofen (ie: brand names Advil or Motrin) is the top choice of OTC medicine for mild to moderate back pain. For severe pain, it is often taken alongside a prescription painkiller such as Vicodin or Percocet. Aspirin is a natural pain medication derived from willow bark. Documentation of its usage dates as far back as Ancient Greece, and it differs from other NSAIDs due to its ability to permanently inhibit the enzyme cyclooxygenase (COX), which causes inflammation. It also this the blood by preventing platelets from binding. Cheap and effective, aspirin is an OTC medication which may also be prescribed. A common NSAID medication, Naproxen is used for a wide variety of pain issues. It isn’t as effective in a chronic situation such as arthritis, but will still make a good temporary pain reliever or backup for certain long-term medications. This brand of acetaminophen is a popular choice for fast, short-term relief from mild to moderate back pain. As it does not reduce inflammation, relief from back conditions which involve inflamed tissue is more limited. If you are suffering from chronic back pain, having a bottle as backup for a stronger medication may be recommended by your doctor. Often, an OTC isn’t enough to counteract chronic pain. In such circumstances, your doctor may prescribe a variety of stronger solutions. The following are just a few examples of the many prescription drugs you may encounter. Both are on the milder and shorter-lasting scale of prescription pain relievers and one is usually the go-to prescription a doctor will initially recommend for moderate to severe pain relief. It contains both a narcotic and non-narcotic pain reliever and like any other opioid, can easily become addictive. Meant for acute and not chronic pain, many will build up a tolerance to Vicodin or Norco over time which can lead to addiction. Both drugs contain the same ingredients but in different proportions so one may work better than the other for some people. Also known a Vistaril, this medication has been around since the 1950s and is used for a variety of ailments. While it is currently used primarily as an anti-anxiety medication, Vistaril can also be used as a pain medication. Many doctors prescribe it either on its own or in conjunction with other pain meds for everything from post-surgery to chronic pain. Vistaril is non-addictive and may be prescribed to replace opiates. It also helps relieve the side effects of stronger pain medications. Medrol is a corticosteroid that can be used to short-circuit lower back pain. To do this, your doctor may prescribe a high initial dosage, instructing you to reduce the dosage daily for about a week. This prescription med is a combination of the opioid oxycodone and acetaminophen. It is effective against moderate to severe pain. While the addictive qualities of oxycodone mean you will likely only be prescribed Percocet on a short-term basis, it can be used long-term under certain circumstances. More commonly known as tizanidine, Zanaflex is a muscle relaxant used for various conditions including spinal cord injuries and multiple sclerosis. To avoid problems, your doctor will start you on a low dosage and gradually increase it. For more information on hydroxyzene and its use a a pain medication, please refer to this article by MDhealth.com. Psychology Today offers an article by Mark Borigini, Ph.D discussing the quest to find “the best medication” for back pain.